With sinking roots and budding leaves. Without a means of getting out. And leave its offspring in the dirt. From every point where branches snap. It would seem this way. Until our leaves have all let go. You will all probably be seeing a lot more posts like these. I love the smell of the earth and the sound of the wind as it shivers through the trees. Today is so nice, I had to take my jacket off. Rudie is the perfect companion. He keeps up. When I stop, he sits and chills with me. I never knew a cat could behave like that. It’s a good bonding experience. I stumbled on a herd of deer. The enacted an instant retreat. I’ve found where they like to sleep, and where they drink, and I’m beginning to learn where they might be found and when. I try to keep a respectful distance, but we’re still busy surprising each other. Maybe one day they will accept me into the herd. Rudie and I decided to take a little walk in the woods. It’s a nice day despite the clouds and moisture. Very therapeutic. Today despite the cold I suited up so Rudie and I could make a pilgrimage to my favorite ash tree. 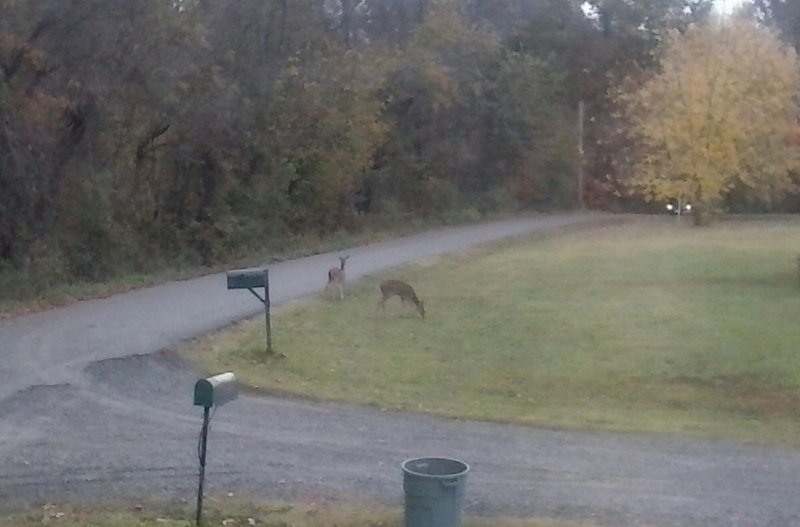 All I had was my phone camera, but I got to watch some deer just now. Nice and peaceful. EQ slightly off . . . Throw the spark off the weave. Just snapping more pointless photos with my dinosaur Kodak digital camera. Briley was right. At this rate it won’t be long before the forest consumes it all. In my defense, it was like this when I first bought the place. I’ve just been too damn lazy and preoccupied to do anything about it. Plus, I actually like it this way. It has a certain charm, don’t you think? I need to make a habit of walking in the forest, now it doesn’t frighten me anymore. I think Rudie would agree.